Fat is the main form of energy stored in cells. Lipid droplet (LD), the organelle responsible for storing fat, plays central roles in maintaining metabolism homeostasis. LD size varies greatly under different physiological conditions, and is important for its normal functions. A new study lead by Dr. Xun Huang from Institute of Genetics and Developmental biology, Chinese Academy of Sciences, discovered the chromatin remodeling regulation of LD size in fruitfly fat cells. Chromatin remodeling complex shuffles the nucleosome and determines the accessibility of DNAs wrapped around nucleosome. Therefore, it controls gene expression. In the recent study, HUANG Xun's group found an Myb/SANT-like domain containing protein, MRT, involves in LD size regulation. Mechanistically, MRT interacts with PZG and the subunit of NURF chromatin remodeling complex. Furthermore, MRT can be recruited to the promoter of plin1, which encodes a LD resident protein and determines LD size. 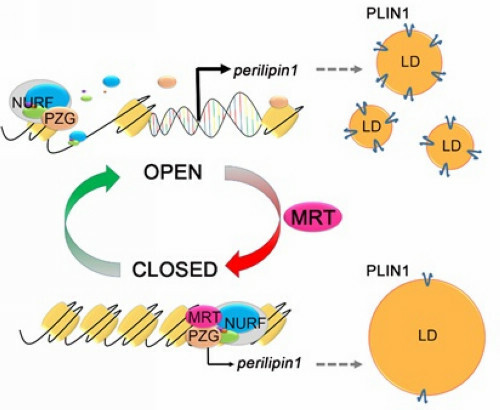 Together with NURF complex, MRT suppresses plin1 transcription, promoting large LDs. This work entitled “MRT, Functioning with NURF Complex, Regulates Lipid Droplet Size” was published on Cell Reports.